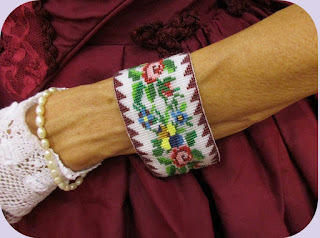 Raquelle's designs are based on period patterns and the Sheen ladies' large collection of original beaded bracelets. Beadwork was very popular during the Victorian era. Raquelle is happy to work with you to customize colors and designs, or to create a copy of an original. She will customize the design to fit your wrist size. Raquelle painstakingly chooses beads that resemble the originals. Each pair of bracelets contains 6000-7000 micro beads! Each bracelet is backed with silk so it lays smoothly on your wrist. Gold box clasps resembling originals make fastening the bracelets simple. Shop now to order your pair!